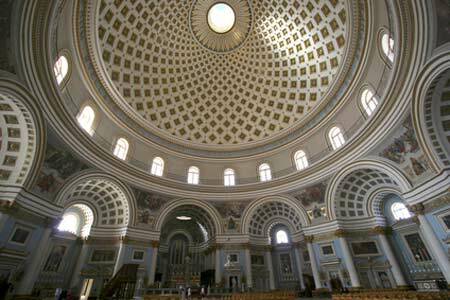 Mosta Dome in central Malta, is a popular place to visit during a holiday to Malta. The Maltese are very proud of the expansive church with the third largest dome in Europe, designed and built by Giorgio Grognet in the early19th century. The Maltese being Roman Catholics and very religious have a collection of stories about the dome and divine protection. One such story dates back to 1942 and bombardment by the German Luftwaffe when evening mass was being celebrated in the church. Two of three bombs bounced off the dome and only one penetrated which did not explode. A replica of the bomb is on permanent display in the church and regarded as a miracle. Rumour has it that the bomb had been sabotaged by workers at the factory where it was produced and contained sand instead of explosive. Various other tales exists that you can find out when you visit. Malta has numerous handsome churches, all beautifully decorated inside that you may also wish to inspect including the 'must see' St John's Co-Cathedral in Valletta.